Day 2 of the June 30 Day Challenge is What I Wore Today. Obviously I wore clothes to work and to teach tonight but I also wore jewelry. I wear jewelry everyday, most of it either made by me or that has some sort of gemstone with its energetic qualities. Today included my engagement and wedding ring, which don't match and I love that. 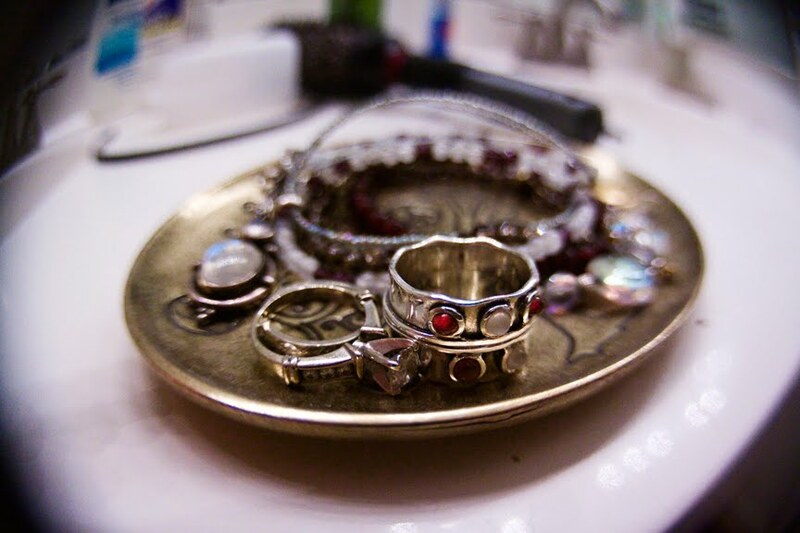 Each ring has it's own meaning and style. A big chunky ring with moonstone and garnet from Sundance. I love their jewelery and would be happy with one of everything. A moonstone pendant on a moonstone and amethyst strand that I made. Moonstone earrings that I made. And two Satya bracelets, one garnet and one smoky quartz, given to me by my friend and boss at Pure Prana. I would gladly take one of everything they have too. I'm doing a lot of moonstone right now because it's the new moon and I'm hoping wearing that stone will enhance the energy of the new moon and my intentions for it. So while my day to day wardrobe can sometimes be fairly simple, trousers and tshirts, fun shoes (that's another days challenge) and jewelry mix it up for me. Yay! Just keep posting them here on the blog. Starting today I'll include your photo's in my daily post. Love your jewelry collection.